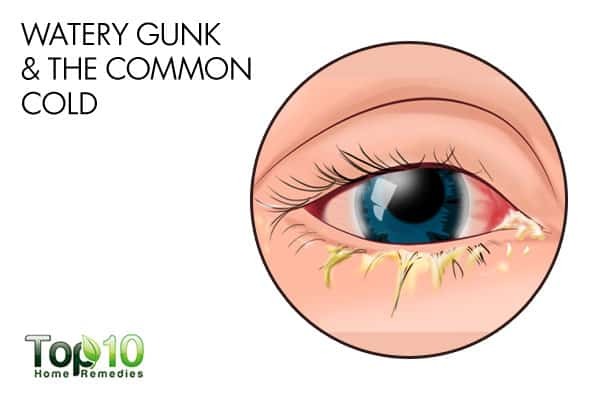 It’s common to have crusty gunk in the corners of your eyes after waking up in the morning. The eyes make mucus, technically known as rheum, throughout the day and night to help flush out waste. 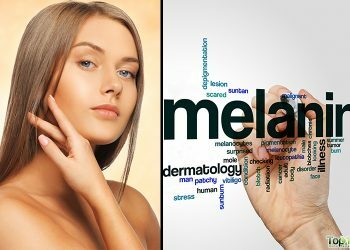 While you sleep, rheum as well as natural oil, old skin cells and other debris build up in the corners of your eyes, which leads to the formation of a crusty discharge. 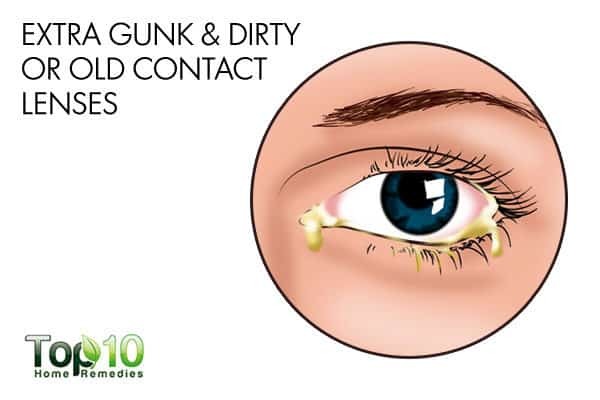 This is commonly called eye gunk, eye goop or eye boogers. Fun stuff, right? Well, a little clear discharge in the inner corners of your eyes when you wake up is normal. All you need to do is wash your eyes thoroughly to get rid of it. But if the eye gunk has changed in color, consistency or volume, it could indicate some kind of health problem. 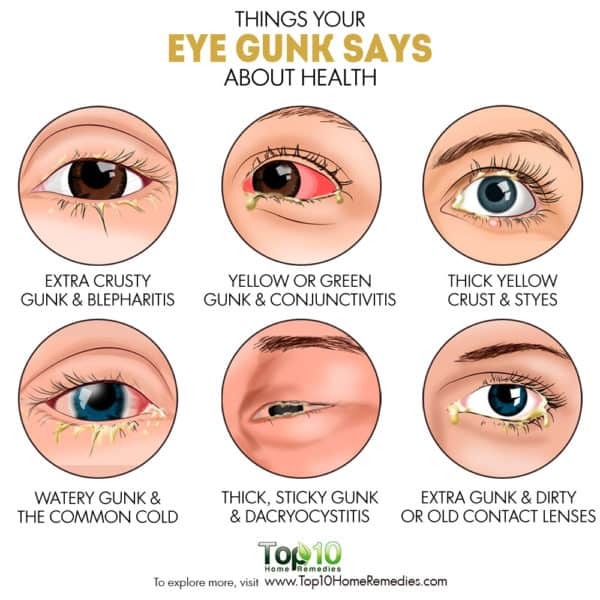 Here are some of the things that your eye gunk says about health. If you’re waking up with gunk that feels extra crusty or thicker than usual, you might be suffering from an eye infection. 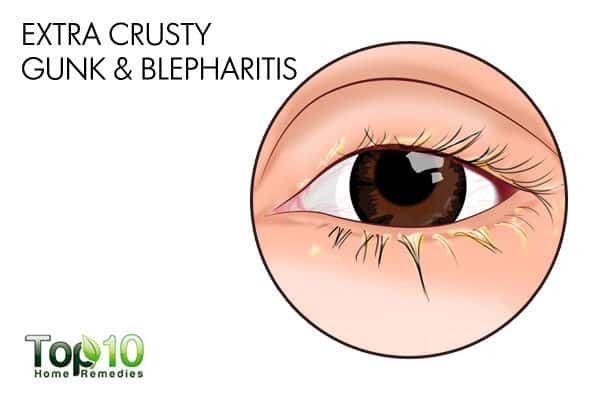 In fact, a thick crusting along the lid line could be a sign of blepharitis, an inflammation of the eyelid. 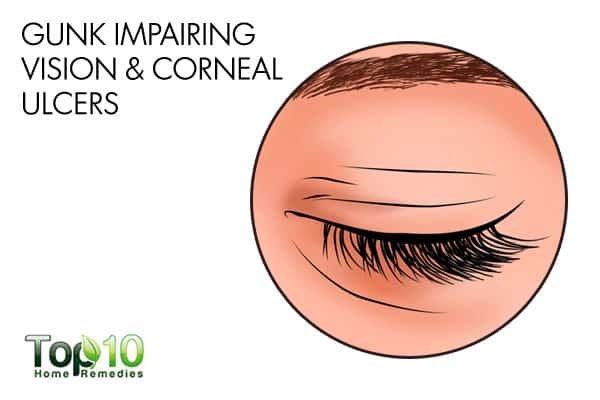 Blepharitis is a condition in which the hair follicles of the eyelashes become clogged or irritated due to an infection, which in turn triggers inflammation. In cases of blepharitis, apart from discharge or crustiness, your lashes might be matted and you may have trouble opening your eyes in the morning because of it. According to the American Optometric Association, applying warm compresses can loosen the crusts (1). It is best to do this several times a day, and especially first thing in the morning. 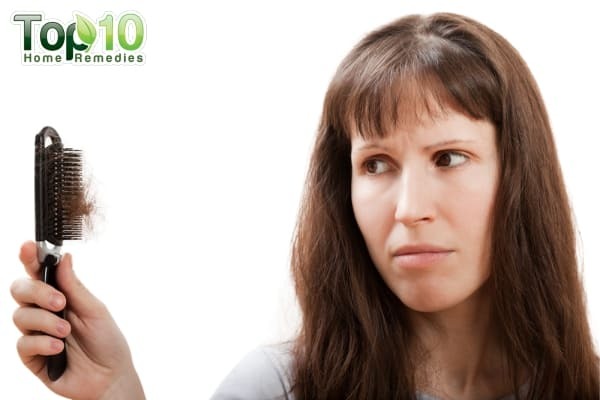 At the same time, maintain good eyelid hygiene to help reduce the symptoms and fight the infection and inflammation. 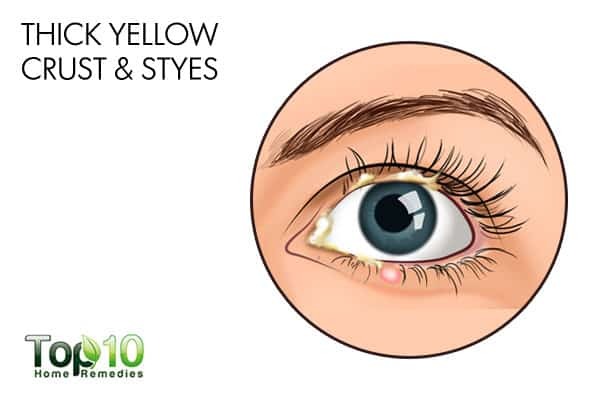 Yellow or green eye discharge that is stringy and thick enough to make your eyes feel like they’re glued shut can indicate an infection like conjunctivitis, commonly known as pink eye. According to the National Eye Institute, about 3 million cases of pink eye occur in the United States each year (2). This type of infection is irritating and uncomfortable, with symptoms like redness, itching, inflammation, tearing, and sensations of a foreign body or burning in the eyes. The condition can be caused by bacteria, a virus, or allergies. Applying cold compresses on the closed eyelids can help ease the itching and swelling caused by pink eye. You can also try applying warm compresses to prevent the discharge from drying out and sticking to your eyelashes. 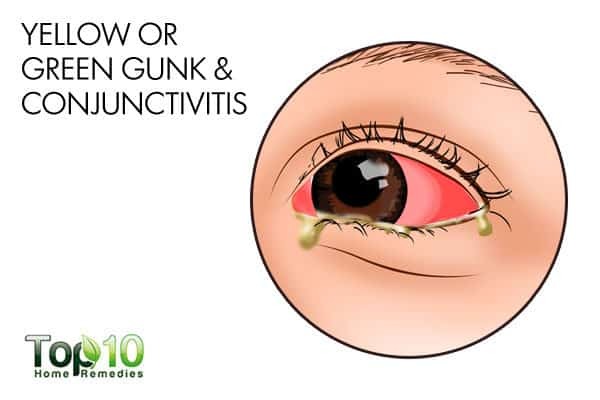 As conjunctivitis is contagious, it is recommended to stay home for a few days until the condition clears up. Styes occur when bacteria get into the oil glands in the eyelids, which causes round, red bumps to form close to your eyelashes. It can cause a thick, yellow crust around the eyelid and also make your eyelid feel sore. A stye can increase sensitivity to light and make your eye watery or feel scratchy. Another common symptom is a feeling that there’s some foreign particle in your eye. A warm compress is the most effective way to treat a stye. It helps thin the pus and oil, so the stye can drain naturally. Avoid using makeup and wearing contact lenses if you have a stye. Also, experts recommend not bursting a stye as it can spread the infection (3). Eye styes usually heal within 1 or 2 weeks. If you are experiencing a watery discharge from the corners of your eyes, it could be an early sign of a common cold. A cold affects all the mucous membranes in your head, so it is common to experience watery eye discharge. Also, you may have red, irritated eyes, along with other symptoms like congestion, sinus pressure, a runny nose, loss of smell or taste, sneezing, and headaches. The most effective and popular home remedies for a common cold include gargling with salt water, resting, and staying hydrated. When your eye gunk is thick and sticky, it could be due to dacryocystitis. Dacryocystitis, an infection of the tear sac, occurs when a blocked tear duct prevents your tears from draining normally and allows bacteria to build up inside the tear sac. This causes the eye to produce a thick and sticky discharge (4). Along with the discharge, other symptoms of dacryocystitis include pain, redness, a watery eye, and swelling in the corner of the eye next to the nose. To relieve pain and swelling from the infection, applying a warm compress on your closed eyelid a few times per day can help. However, the main treatment for dacryocystitis is antibiotics. If you wear contact lenses and your eyes are producing more gunk than usual, it is time to check your contact lenses. This is because dirty or old contact lenses might contain viruses or bacteria that are getting into your eyes. 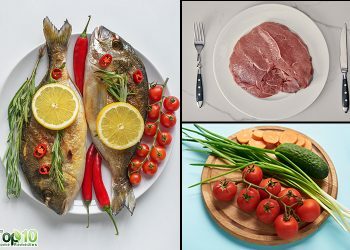 This increases the risk of an eye infection and causes your eyes to produce more discharge. Get your contact lenses checked by an expert and replaced or upgraded if needed. Always wash your contacts in appropriate solution that is recommended by your eye doctor, and do not sleep with your contact lenses in your eyes. If you have a pus-like discharge from an eye that makes it hard to see, you need to see your doctor. Sometimes, it could be due to a corneal ulcer, which is an infected sore on the cornea that can result in discharge so thick you have trouble seeing. 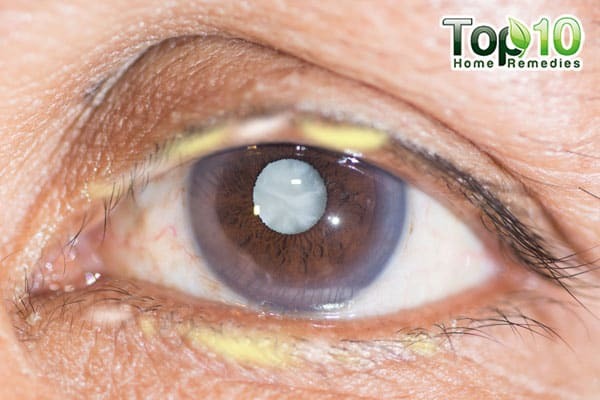 This type of infection is common in people who wear expired soft contact lenses or disposable contact lenses for an extended period of time. Along with constant and thick gunk, other symptoms include an itchy eye, watery eye, burning or stinging sensations in the eye, a red or pink eye, and increased sensitivity to light. If you have symptoms of a potential corneal ulcer, get your eyes checked by an eye doctor. Depending upon the cause, prescribed antibacterial, antifungal, or antiviral eye medication may be needed to treat the underlying problem. American Academy of Ophthalmology, a corneal transplant can replace your damaged cornea with a healthy donor cornea to restore vision (5). Avoid touching your eyes with dirty hands. Wash your hands frequently, especially if you have an eye infection. Avoid using any kind of eye makeup if you have an eye infection. If you experience eye discharge when wearing contacts, remove your lenses and see your eye doctor. Always remove your contacts as instructed and ensure you are cleaning them properly. 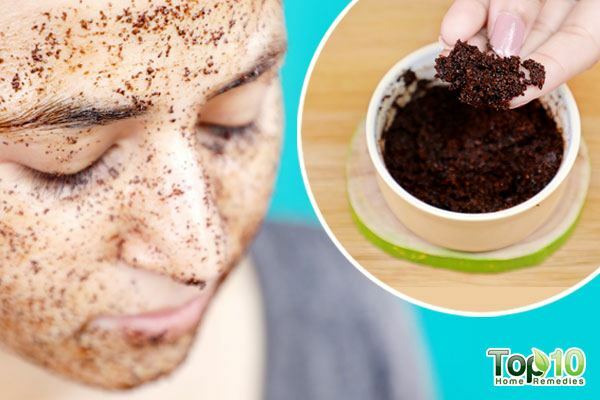 Discard old eye makeup and avoid sharing eye makeup with others. Blepharitis. American Optometric Association. https://www.aoa.org/patients-and-public/eye-and-vision-problems/glossary-of-eye-and-vision-conditions/blepharitis. Accessed March 1, 2018. Facts About Pink Eye. National Eye Institute. 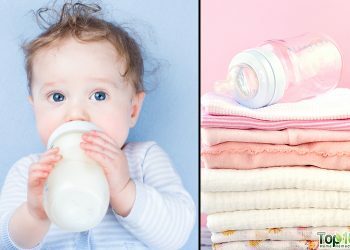 https://nei.nih.gov/health/pinkeye/pink_facts. Published November 1, 2015. Accessed March 01, 2018. Stye. NHS Choices. 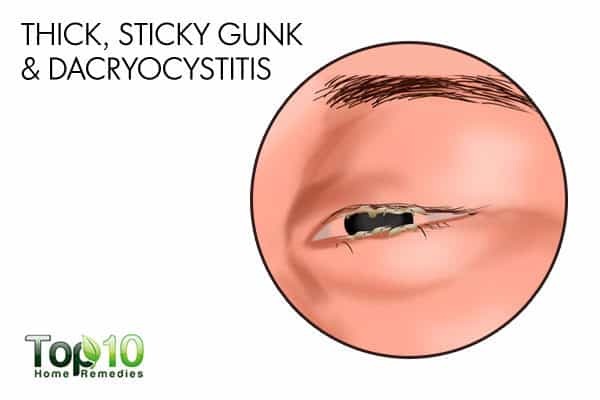 https://www.nhs.uk/conditions/stye/. Accessed March 01, 2018. Tear Duct Infection (Dacryocystitis). Harvard Health. https://www.health.harvard.edu/vision/tear-duct-infection-dacryocystitis. Accessed March 01, 2018. Corneal Ulcer Treatment. American Academy of Ophthalmology. https://www.aao.org/eye-health/diseases/corneal-ulcer-treatment. Published October 05, 2017. Accessed March 01, 2018.